(PhysOrg.com) -- We've all heard that no two snowflakes are alike. Caltech professor of physics Kenneth Libbrecht will tell you that this has to do with the ever-changing conditions in the clouds where snow crystals form. Now Libbrecht, widely known as the snowflake guru, has shed some light on a grand puzzle in snowflake science: why the canonical, six-armed "stellar" snowflakes wind up so thin and flat. Few people pay close attention to the form that snow crystalsa.k.a. snowflakestake as they fall from the sky. But in the late 1990s, Libbrecht's interest in the tiny white doilies was piqued. The physicist, who until then had worked to better understand the sun and to detect cosmic gravitational waves, happened across an article describing one of many common snowflake structuresa capped column, which looks something like an icy thread bobbin under the microscope. Such a snowflake starts out, as all do, as a hexagonal crystal of ice. 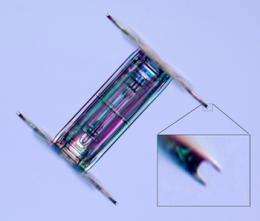 As it grows, accumulating water molecules from the air, it forms a tiny column. Then it encounters conditions elsewhere in the cloud that promote the growth of platelike structures, so it ends up with platelike caps at both ends of the column. Now Libbrecht believes he's on his way to explaining one of the major outstanding questions of snowflake sciencea question at the heart of his original interest in capped columns all those years ago. 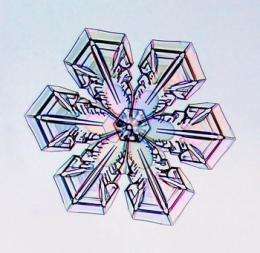 Scientists have known for more than 75 years that at conditions typically found in snowflake-producing clouds, ice crystals follow a standard pattern of growth: near -2°C, they grow into thin, platelike forms; near -5°C, they create slender columns and needles; near -15°C, they become really thin plates; and at temperatures below -30°C, they're back to columns. 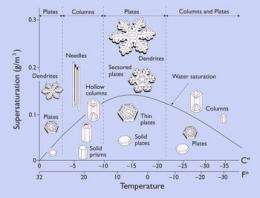 But no one has been able to explain why such relatively small changes in temperature yield such dramatic changes in snowflake structure. Isn't that Frosty's baby picture? I love research like this. You really have to have a scientific mind to be fascinated by inane things like dust motes, ice crystals and poo flinging monkeys. making the edges about as sharp as a razor blade. Ow the snowflakes are cutting meeee!! I'm being murdered by snow flakes...Nooooo!